Do the PV modules used at your plant generate the expected amount of energy? Is performance decreased in a linear fashion in accordance with the factory warranty granted? Are there micro-cracks on the cells? Are they connected to and sorted at the inverter in an optimal fashion? Kmetrics, being the exclusive Greek representative of the German company MBJ services, is now capable of testing your PV modules on site for the first time ever. By using the mobile PV module testing laboratory, it is now possible to conduct on-site tests on your modules, thus allowing you to verify their condition. In particular, the "Mobile PV-Testcenter" takes power measurements of your modules according to EN60891, conducts electroluminescence inspections to highlight possible problems - cracks on the module cells, and uses thermal imaging of the modules to identify hotspots. Optimizing the performance of the PV plant - increasing generation levels. Conducting PV tests on site. Conducting PV module tests before the installation. Conducting tests throughout the year, regardless of sunshine. 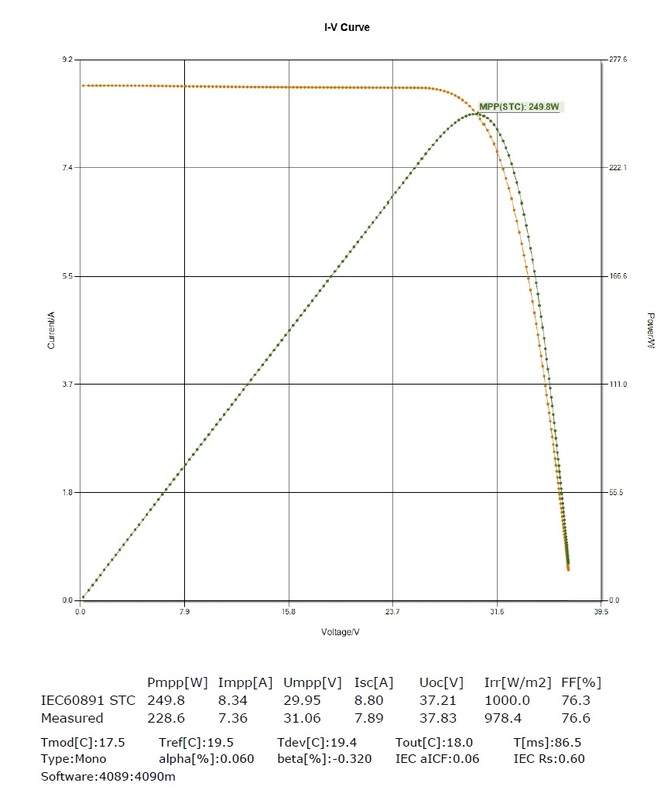 Repeatability of measurements due to laboratory conditions. Testing volume: 400 modules per 8 hours. Avoiding the costs associated with the packaging and transport of PV modules to conduct the tests at the laboratory. Avoiding any risk of damaging the PV modules during transport to the laboratory. Minimizing the testing times and downtimes of the PV plant. Capability of using used PV modules in existing or new plants. Minimum cost, as compared to the sum invested. Reduced costs for insurance policies obtained from insurance companies. Certification of defects - inspection after natural disasters. Issuing a test certificate for each module. Measuring the power output of the PV modules helps determine the actual electric power of the modules under specified sunlight and temperature conditions. The power value is compared against the one specified by the manufacturer according to IEC/EN60891, to verify whether the modules conform to the specifications. A PV cell is a diode that converts light directly into electricity. This phenomenon, however, occurs in the opposite direction too. Electricity leakage from a PV cell results in the emission of light (LED) from the cell. This property of PV cells, i.e. irradiating under the influence of electric current, is used to detect problems. Thermal imaging by the use of an infrared camera measures the thermal irradiance of a PV module. This measurement is taken using the widely-known “thermography cameras”. 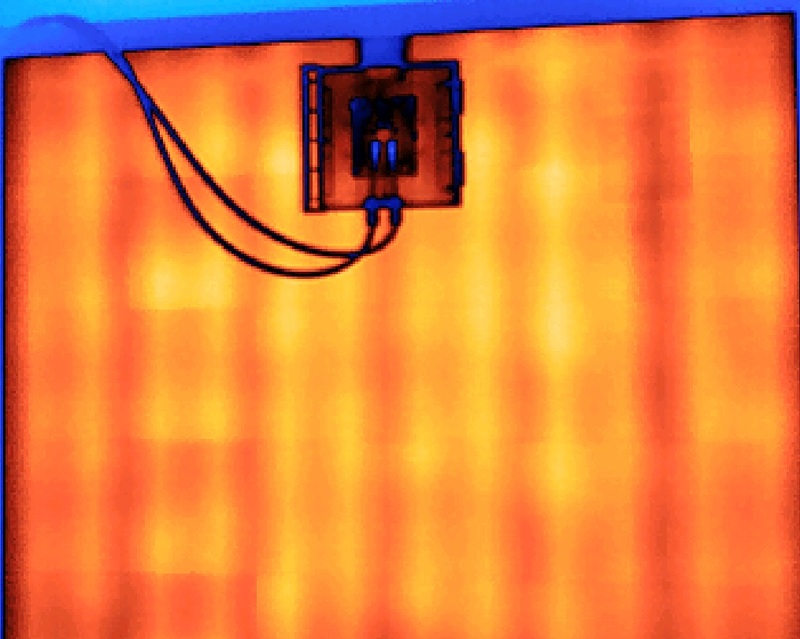 These cameras capture temperature-varying areas on surfaces in the form of different colors. 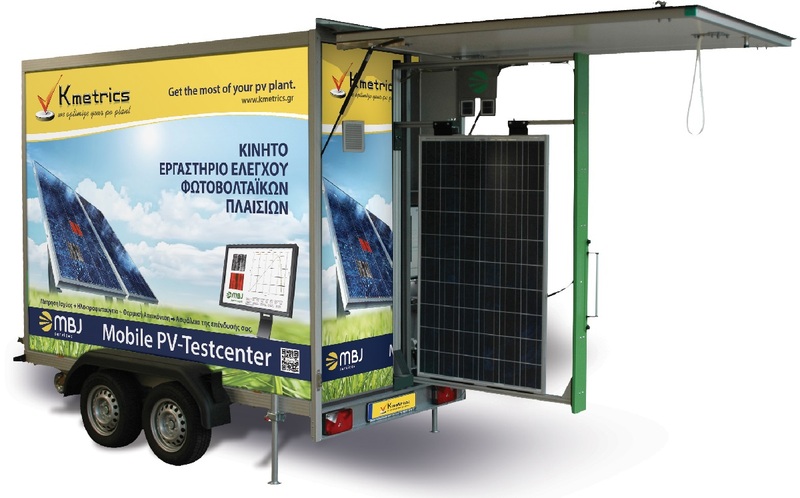 The “Mobile PV-Testcenter” is a LED solar simulator. Sunlight intensity is checked and adjusted very accurately to the appropriate levels for each PV module. 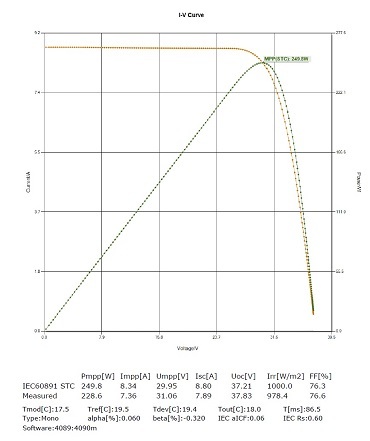 The maximum power(Pmpp) is measured according to IEC/EN60891 using an adjustable electronic load. The open-circuit voltage (Voc) and short circuit current (Isc) are also measured. The measurement results are used to generate graphics depicting the volume, current, power and irradiance curves. The maximum power point (Pmpp) is also determined. These results confirm, under laboratory conditions, the actual power of the PV modules. A PV cell is a diode that converts light directly into electricity. This phenomenon, however, occurs in the opposite direction too. Electricity leakage from a PV cell results in the emission of light (LED) from the cell. This property of PV cells, i.e. irradiating under the influence of electric current, is used to detect problems. The wavelength radiated by cells has a width of approximately 1150nm, which is invisible to the human eye. By using special-purpose cameras, however, it is possible to detect defects on PV cells, which would be impossible to identify by the naked eye. Typical PV cell defects include silicon contamination during the production process and micro-cracks during jointing. However, during the packaging, transport and reloading operations carried out before the product reaches the end user, as well as during final installation by the PV plant installer, it is impossible to avoid subjecting the PV cells to such stresses that could create micro-cracks. 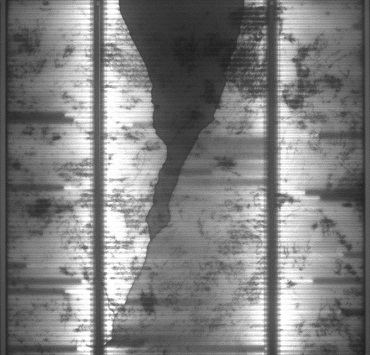 Micro-cracks may also occur on a module due to bad weather, e.g. hail, high winds, etc., or due to malicious acts, as well as incorrect cleaning. Micro-cracks on PV module cells are a crucial factor that affects the final performance of each module. The stresses exerted on the modules during packaging, transport, reloading, unpackaging and final installation has often made the factory measurement and sorting practically useless. 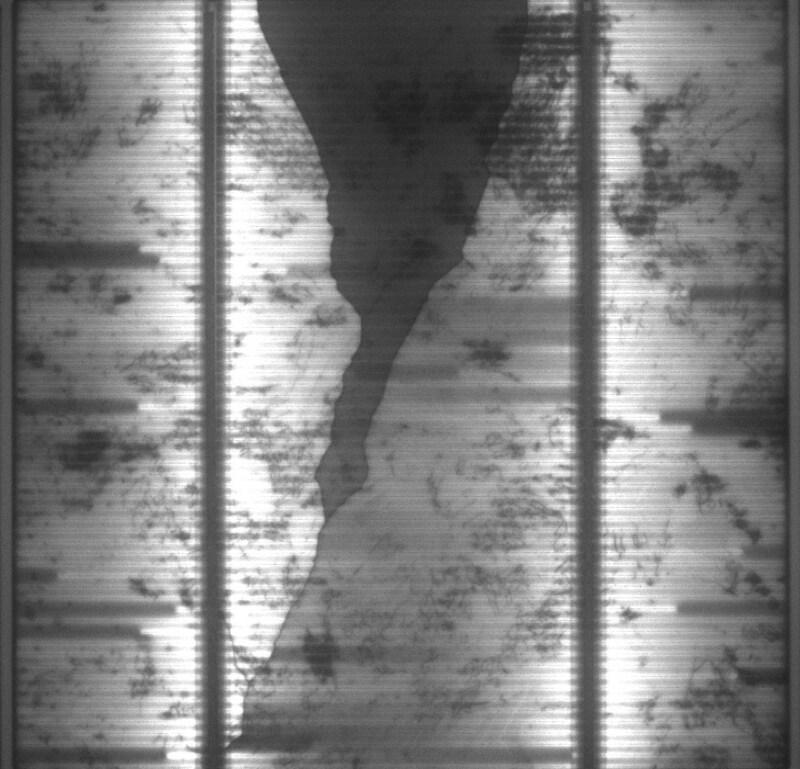 The occurrence of a micro-crack on just one module can reduce the performance of the entire string to which the defective module belongs, as that module will reduce the current generated, and therefore the performance of the entire string. During the inspection, the “Mobile PV-Testcenter” applies appropriate voltage to the panel and uses special cameras to “photograph” the surface of the module. The overall picture of the module, as generated with the electroluminescence method, provides information on whether there are defective module cells and identifies these particular cells as well as the severity and magnitude of the defect. The size and extent of micro-cracks are a crucial factor that determines whether a module should be designated as “acceptable” or “rejectable”, or whether there are risks of hotspots, reduced performance, diode switching, etc. Thermal imaging by the use of an infrared camera measures the thermal irradiance of a PV module. This measurement is taken using the widely-known “thermography cameras”. These cameras capture temperature-varying areas on surfaces in the form of different colors. This allows for testing the PV modules to identify defective cells with hotspots. The “Mobile PV-Testcenter” is fitted with a high-resolution IR camera, which is capable of identifying hotspots very accurately. It is also possible to check the junction boxes for material failure in that part of the PV modules.